Even with billion-dollar advertising budgets, the giants of the mainstream media are falling like flies . . . But AMERICAN FREE PRESS print newspaper and its website remain in business. Because we can say what they cannot: the truth. 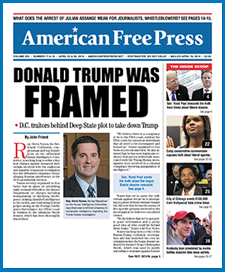 AFP NEWSPAPER is your no-nonsense, uncensored, independent BIWEEKLY source for important news about the pressing issues facing our nation and the world today—unvarnished and many times politically incorrect. And AFP’s WEBSITE is your DAILY source for what is happening right now. But we have so much work left to do and so few resources. To help keep alive this independent voice of America’s vanishing middle class, please donate to our mutual cause.